And so starts one of the greatest works of fantasy ever written, the gateway drug for nearly all genre fans. For many of us, "The Hobbit" is the work that got us hooked on fantasy, obsessed with stories of epic quests, grand adventures, mythical creatures, etc. I read “The Hobbit” in second grade. I believe it was the first novel I read all on my own, and it was one of the more revelatory experiences of my lifetime, one of the books that taught me how literature has the power to transport us to another time and place – another world, in this case – to take us on a journey far grander than anything we could experience without good fiction. You read “The Hobbit,” and you crave more, more fantasy, more adventures, and Tolkien himself had only so much to give, destining any young “Hobbit” reader to eventually dive into the wider world of fantasy. 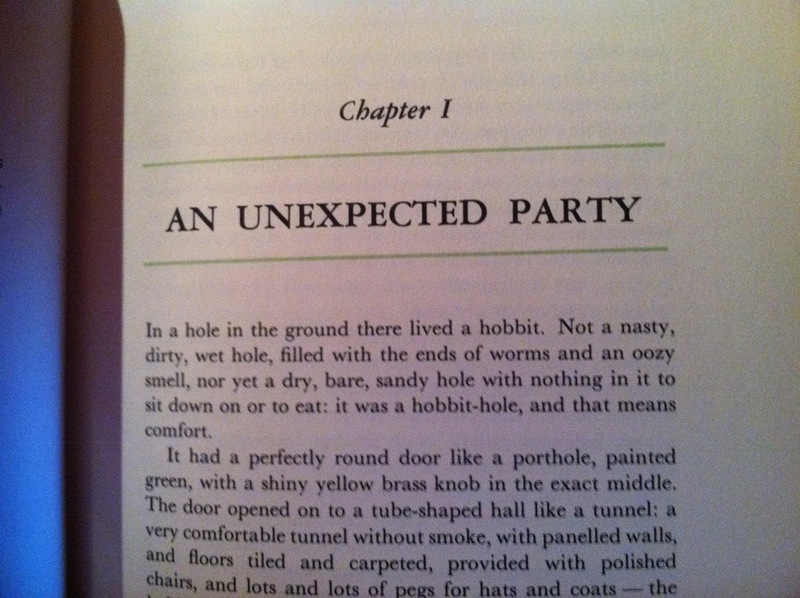 The gateway drug effect is evident right off the bat, not just in the wonderful introduction that is "Chapter One" as a whole, but in the first few paragraphs, as Tolkien introduces Hobbits - who they are, what they are like, what they do, etc. Or, actually, where they live. It's the perfect hook, and it's a very distinctly Tolkien hook. If you study Tolkien's life for any length of time, you'll quickly learn how his history drove him to create works like "Hobbit" and "Lord of the Rings," and if you study his academic history in relation to his writing, one thing will become abundantly clear: this man was not trained as a creative writer. He was a brilliant, highly trained linguist, yes, but he never took so much as a class on creative writing, and it shows early on, and then again and again and again as you work your way through his works. But that's what made him brilliant. There was nobody around to tell him that what he was doing was different and often crazy, and so he went with it, and the results speak for themselves. See, a creative writing teacher would probably instruct one not to open their book with a massive exposition dump, nor to introduce your main character with a long, flowing description of their house. But that’s what Tolkien does, introducing Bilbo, and the larger world of Middle Earth, for that matter, not by describing Bilbo’s stature or appearance, nor by explaining his race, nor by telling us where exactly this story takes place, but by taking us on a tour of Bag-End. And it’s an absolutely perfect way to open the story, one of those delightfully engaging flourishes that only an untrained fiction writer like Tolkien could imagine. He goes on from there to introduce Bilbo, and hobbits, at large, and even though this upfront exposition is unconventional stylistically, it’s brilliant functionally, and works for two main reasons: First, the information Tolkien has to reveal is fascinating and wildly creative, and second, his prose is beautiful and gripping. "The Hobbit" draws a young reader into the world of genre fantasy in the first few paragraphs because Tolkien is so imaginatively matter-of-fact. 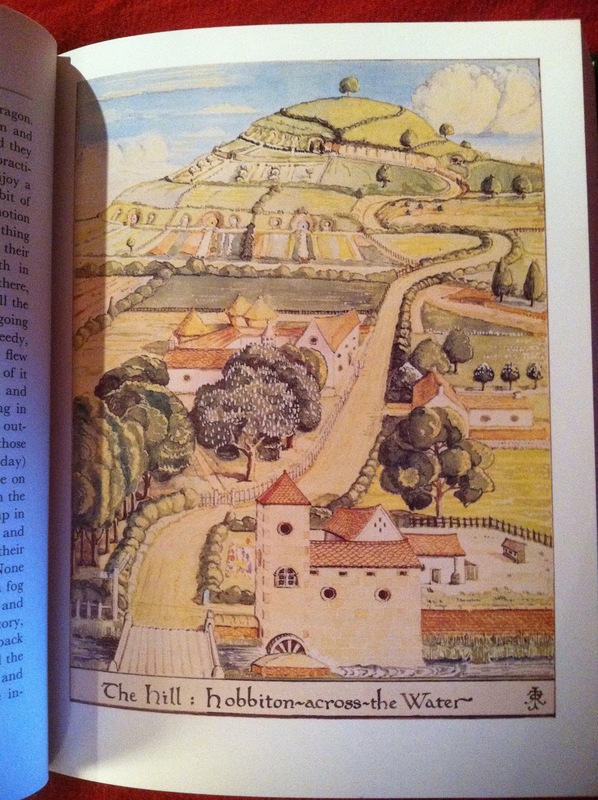 When a child hears a sentence like "In a hole in the ground there lived a hobbit," they want to hear more. And Tolkien gives them more. He gives them everything. "These are Hobbits, and this is what they like, and this is what they look like, and this is what they do in their free time, and here's an example of a Hobbit for you to follow, and here's the Hobbit's lineage, and what his family looks like, and...." so on and so on. A trained creative writer would never do that. Tolkien wasn't trained, and so he wrote on instinct, and his instinct was to be a fantastic storyteller, and so, as a child, you read those opening paragraphs and become enthralled by these mysterious creatures, and from that point on, Tolkien has you. Bilbo Baggins, a Hobbit, lives a comfortable, adventure-free, and thoroughly respectable life at Bag-End in Hobbiton. 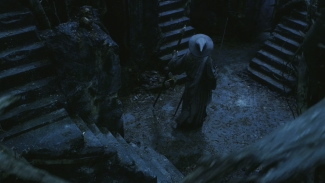 One day, he is visited by the wizard Gandalf, who invites Bilbo to take part in an adventure. Bilbo doesn’t like the sound of that at all, but because he’s polite, invites Gandalf to join him for tea the following afternoon. Gandalf leaves a mark on Bilbo’s door, and the next day, when Gandalf is scheduled to arrive, Bilbo is instead greeted by a series of Dwarfs, arriving alone and in pairs, until their number reaches thirteen, with Gandalf bringing up the rear. 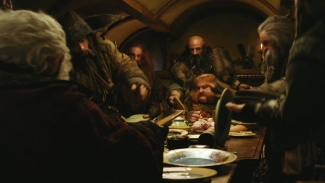 Bilbo is beside himself with worry – he had not planned on so many guests! – but once they are all settled, Gandalf and the Dwarfs reveal the nature of their adventure, that they are to journey to the far-away Misty Mountains, and that Bilbo will be coming along with them. The mark Gandalf left on Bilbo’s door was that of a Burglar seeking employment, so the dwarfs assume Bilbo is eager to join them. Bilbo wants no such thing, at first, but then he begins to hear the Dwarfs’ songs and tales, and something stirs inside him, a desire to prove himself to his new acquaintances. 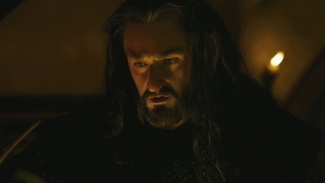 He asks Thorin Oakenshield, leader of these Dwarfs, to tell him the full story. Thorin does so; when Thorin as young, he and his family were quite wealthy, having amassed a vast array of treasure. This drew the attention of the fearsome dragon Smaug, who attacked Thorin’s village, killing most of the dwarfs living there, and stole the treasure for himself. Thorin and the dwarfs are travelling to the Misty Mountains to reclaim what is rightfully theirs, now that they have Gandalf and a very useful map on their side. The dwarfs and Bilbo all go to bed, with Bilbo unsure of whether or not he will partake in this journey. A fun piece of history: J.R.R. Tolkien first conceived “The Hobbit” while grading papers one afternoon; according to the biography of Tolkien by Humphrey Carpenter (which I did a book report on in fourth grade), the idea came to him in a sudden, surprising burst of inspiration, and he wrote down on the back of one of his student’s papers the words: “In a whole in the ground there lived a hobbit.” A linguist by training, Tolkien simply liked the word ‘hobbit,’ which had strolled into his mind unexpectedly, and he went from there. I wonder if that student got the paper back with the sentence still scribbled on the back? 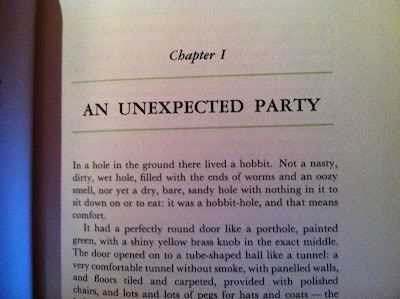 It’s fun to read Tolkien’s description of the Hobbit hole see how closely Peter Jackson stuck to that vision in the “Lord of the Rings” movies. The production design was extremely faithful, though there are some minor differences. Tolkien writes that the hole had “…paneled walls, and floors tiled and carpeted…” whereas in the films, the hole is primarily constructed of wood. There’s definitely no carpet. I love the introduction to the Bagginses, who are respectable “…because they never had any adventures or did anything unexpected.” Frodo quotes that line in the “Fellowship of the Ring” movie. Tolkien follows up with this sentence: “This is the story of how a Baggins had an adventure, and found himself doing and saying things altogether unexpected.” Tolkien had so thoroughly established a Hobbit’s nature at this point that from that sentence on out, I’m hooked. I want to see the adventure that would get such a creature as a Hobbit out of his hole! I did not know that Bilbo was a Took. Or at least, I forgot in the years since reading “The Hobbit,” and never made the connection reading/watching “Lord of the Rings.” Beladonna Took was his mother, and his grandfather was the Old Took, who Bilbo would eventually surpass in age. While describing his lineage, Tolkien succinctly paints a fine portrait of who Bilbo is and the familial influences warring within him. The Tooks, odd and sometimes adventurous, and the Baggins, the epitome of ‘respectable,’ reserved, cautious Hobbits. But Bilbo, deep down, is more of a Took, with an adventurous spirit he has carefully repressed but is patiently waiting to come out. This is fascinating – I’ve always associated the Baggins with adventure because of Bilbo and Frodo, but historically, the Baggins were nothing of the sort. Indeed, it was Bilbo himself who redefined the family’s identity. 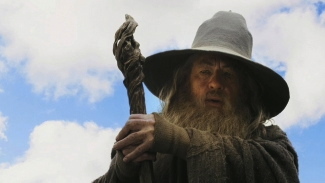 Sir Ian McKellan as Gandalf the Grey in "The Hobbit"
Gandalf’s introduction is remarkable: “Gandalf! If you had heard only half of what I have heard about him, and I have only heard very little of all there is to hear, you would be prepared for any sort of remarkable tale.” Tolkien positions himself as the storyteller in this novel, someone familiar with the events, relating them to us almost as if he’s in the room, reciting these events from memory. This allows him to expertly characterize someone like Gandalf. If the storyteller, someone so full of knowledge about these marvelous events, knows only a little bit about this wondrous wizard, and is nevertheless in awe of him, then Gandalf must be truly fantastic! Keeping Gandalf somewhat mysterious, even in the thick of “Lord of the Rings,” is part of what makes him a great character. In fact, Tolkien keeps Gandalf at such an arms length throughout “The Hobbit” that there are many opportunities to embellish the story, to wonder what Gandalf has been up to and link that into the larger events of the Middle Earth lexicon, something I’m very excited to see Peter Jackson play with in the films. Gandalf wears a scarf. Since my mental image of Gandalf is, of course, Ian McKellen, I have trouble imagining this. I just wind up picturing the iconic fourth ‘Doctor Who,’ played by Tom Baker. Here’s a snippet of one of my favorite passages: “Good morning,” said Bilbo, and he meant it…. “What do you mean?” [Gandalf] said. “Do you wish me a good morning, or mean that it is a good morning whether I want it or not; or that you feel good this morning; or that it is a morning to be good on?” “All of them at once,” said Bilbo.” It goes on from there, but this is one of Tolkien’s absolute greatest bits of writing, one that gives you the gist of both characters. Bilbo, sincere and respectful, and Gandalf, playful and mildly abusive of his intelligence. It’s definitely a passage that informs Ian McKellen’s performance. The rest of their conversation expands on that brief glimpse into their identities. Gandalf, ever manipulative, says he’s looking for someone to go on an adventure, though he’s already picked Bilbo who, of course, wants no part in it. But Gandalf, amiable and intense at the same time, awes Bilbo with his mere presence. 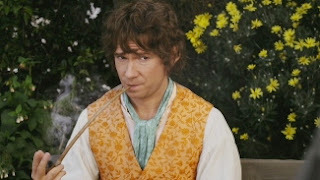 Bilbo, after all, knows many stories about Gandalf, and even mentions the fireworks! Bilbo leaps into a speech about the stories he’s heard about Gandalf, a speech that tells us as much about Bilbo as it does about the Wizard, revealing Tolkien’s talent for spinning direct exposition into something more. The stories Bilbo recounts excite him, and he even says “Bless me, life used to be quite inter – I mean, you used to upset things badly in these parts once upon a time.” Though Bilbo tries to be a good, quiet Hobbit, we know deep down he wants something more. It’s amazing to see how many of the elements that define these characters were present right from the start. In essence, the first conversation between Bilbo and Gandalf is, essentially, an elaborate mind-game on Gandalf’s part to plant the seeds of adventure in the Hobbit’s brain. In fact, the same could be said of the whole chapter. Gandalf plans everything perfectly to attract Bilbo to the adventure, to get him out the door on his own accord, rather than being forced, and what’s wonderful is that we really don’t know why Gandalf does this. The Dwarfs’ arrival is such a masterful comic set-piece, with them all coming in, first one-by-one, then in groups, slowly upending this Hobbit’s idea of comfort. Each say subtly disturbing things to the Hobbit, like “They have begun to arrive,” and “Let us join the throng.” To a Hobbit, it’s a bit like psychological torture. 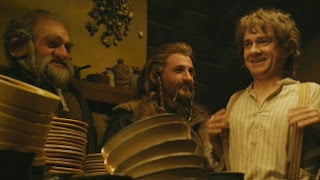 They’re all calling for different foods and ales, and all the while Bilbo is worried about running out of food and drink for himself. When Gandalf comes in, you can practically feel him relishing the chaos. So much fun to read, written with clean, simple prose easy enough for a child to be in awe of but engaging and detailed enough to draw in an adult as well. And then, after dinner, there’s the best part, where the Dwarfs get up to remove all the dishes and silverware, balancing it frivolously and singing a mocking little ditty. “Chip the glasses and crack the plates!/Blunt the knives and bend the forks!/That’s what Bilbo Baggins hates…You can see a frame of this scene in the “Hobbit” trailer, which indicates that Jackson is definitely trying to capture the fun and whimsy of the novel. What makes this scene work is that while it’s oodles of fun to read and imagine, it’s also fun at the expense of our main character. It’s a delicate balancing act, Tolkien asking us to empathize with and laugh at Bilbo at the same time, but it totally works, and only makes Bilbo more endearing. I’ve always loved the Songs in Tolkien’s books; some find them distracting, but Tolkien is such a brilliant writer, and an underappreciated poet. Look how much he expresses through the “Misty Mountains” song – hell, it’s the entire backstory of the book, about Smaug and Thorin’s ancestors and the treasure they need to reclaim. It’s a magical moment, and like Bilbo, we are both intimidated and intoxicated by the singing. For a child, like for Bilbo, it is a song so mysterious, haunting, and different that we yearn to know more. Music signifies the true magic in these stories, and it is, perhaps, one of the few things Jackson left out in “Lord of the Rings” (except in “Return of the King,” where Pippin sings to King Denethor in a moment that feels extremely Tolkien-esque). It’s good to see singing making a comeback in the “Hobbit” films. Another one of my favorite passages: “As they sang the hobbit felt the love of beautiful things made by hands and by cunning and by magic moving through him, a fierce and a jealous love, the desire of the hearts of dwarves. Then something Tookish woke up inside him, and he wished to go and see the great mountains, and hear the pine-trees and the waterfalls, and explore the caves, and wear a sword instead of a walking-stick.” That’s the Bilbo we will come to know and love – and again, it’s no coincidence that music is what brings that out of him. Thorin’s speech is important for a number of reasons, mainly expository, but his speaking style also gives us a good idea of who Thorin is, what grandeur and importance he possesses. Tolkien the Storyteller takes a little diversion here to tell us about Bullroarer, the Old Took’s great-grand-uncle, “…who was so huge (for a hobbit) that he could ride a horse.” For some reason, that’s a detail I have always remembered very vividly when thinking of Middle Earth. We see Gandalf’s plan to get Bilbo on board come to fruition as Gloin question Bilbo’s burglaring skills: “As soon as I clapped eyes on the little fellow bobbing on the mat, I had my doubts.” This stirs something in Bilbo. 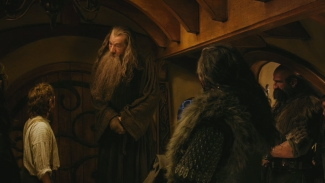 “He suddenly felt he would go without bed and breakfast to be thought fierce.” This encounter with the Dwarfs has given Bilbo a desire to prove himself, and when he stands up for his dignity, we get the first moment where Gandalf is actually serious, admonishing Gloin for questioning Bilbo’s worth:“If I say he is a Burglar he is, or will be when the time comes. There is a lot more in him than you guess, and a deal more than he has any idea of himself." One of the functions Bilbo serves in this chapter is as a proxy for the reader; he may be a little reluctant at first, but once he starts thinking with the Took side of his brain, he becomes fascinated by Gandalf and Thorin’s stories, and is just as eager to hear the full tale behind the Dwarfs’ song as we are. The story about Smaug’s treachery and the loss of Thorin’s family treasure is a damn good one, too, suggesting a really fantastic adventure to come. And how can you not love Smaug even this early on, only hearing a description of him from Thorin? He exterminated an entire village of Dwarfs, just so he could steal their treasure, put it in his cave, and sleep on it. Not spend it, but use gold as a bed. Smaug is badass. Peter Jackson is adapting “The Hobbit” into two movies, and will be expanding the story by exploring various narrative threads Tolkien only hints at in the book. One such thread can be found in this chapter: Gandalf explains to Thorin that he found the map and the key when he rescued Thorin’s father from the dungeons of Dol Guldur, the lair of the Necromancer. The Necromancer, according to extended Tolkien lore, is the corporeal form of Sauron, antagonist in “Lord of the Rings,” and Benedict Cumberbatch has been cast to play him (as well as voice Smaug) in the movie. So we know Jackson will be dramatizing this bit of back-story, which should be very cool. You can see a few frames of what must be Dol Goldur in the movie’s Trailer. 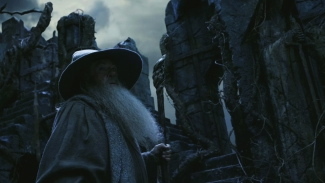 Gandalf at Dol Guldur in the trailer for "The Hobbit: An Unexpected Journey"
We end the chapter on a lighter note, as Bilbo takes breakfast orders from all thirteen dwarfs and then has to make spare bedrooms for them all. Letting the Dwarfs bounce off Bilbo and his cautious Hobbit sensibilities like this is never not funny.